Catclub Zealand is organizing the 7th Dragoon Dutch Cup on 8 and October 9, 2016. This is an educational and fun weekend, suitable for both beginners and experienced youth sailors. 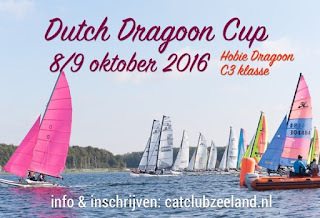 It has become Europe's largest event for Hobie Dragoon sailors. Youth sailors are trained while racing (& learning). Between each race ample time is taken by to evaluate. At the same time the event does have a ranking and there will be prizes awarded for both the Dragoon class as the class C3 (Hobie 16, Hobie Max, SL16, Nacra 500 etc). All associations are invited to bring their own trainer (s), private speedboat is convenient. There is a head coach in place to coordinate everything. The Veerse Meer is very sheltered, so there can be sailed in all circumstances. The sailing is done directly for the association. Catclub Zealand Muidenweg 221 Wolphaartsdijk. Map http://g.co/maps/dag4w .